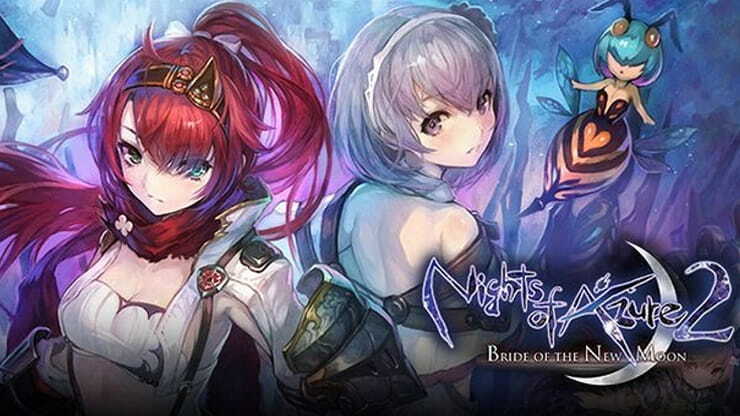 Nights of Azure 2: Bride of the New Moon is a fantasy genre action role-playing game developed by Gust and published by Tecmo Koei for the PS4, PlayStation Vita and Microsoft Windows. The game is a sequel to Nights of Azure and scheduled to be released in 2017. On April 14th, it was announced the game will also be receiving a Nintendo Switch version. Long ago, the great battle against the monstrous Nightlord left a lasting effect on the world. Foul creatures, known as “Fiends,” surfaced during the night, leaving humans with only the light of the sun as their ally. A world that would never sleep. An agent of the Curia, Aluche, is given orders to guard her close friend and now-priestess, Liliana. After fighting fierce battle after battle, the two eventually find their way to the Curia, only to discover a cruel truth. Liliana had been chosen to be the next sacrifice, the “Bride of Time,” one fated to be offered up to the Moon Queen. Filled with despair and shock, Aluche begins to carry out her mission of escorting Liliana to the Moon Queen’s location. However, they never make it. On the way, they’re attacked by a fierce fiend, and Aluche dies in battle. When next she wakes, she discovers that she has been brought back from the dead as an artificial half-demon. According to a Curia researcher, Liliana was nowhere to be found, leading them to come to the conclusion that she had been taken to the ruined city. The newly revived Aluche makes her way there in hopes of saving her friend, an unwanted, dark power lurking within her body. Trainer for the game Nights of Azure 2: Bride of the New Moon, you can use it to activate these essential Cheat Codes: Infinite HP, Infinite MP, Max Tension Gauge, Max Chase Gauge, Max Combo, Skills no Cooldown, Super Speed, Infinite Libra, Infinite Blood, One Hit Kill, Freeze Mission Timer. Note: This cheat tool is for the original version v1.0 (20171117) of the game Nights of Azure 2: Bride of the New Moon.